DKM AN-NAHL FKH IPB » Blog Archive » Trapped then amputated… such a tragedy! The striped animal was found illegally trapped in Air Rami industrial forest, North Bengkulu, Sumatra. It is understood that the tiger was trapped on February 12, only to be discovered on February 15, in the forest, around 180 km from Bengkulu City. Bengkulu Natural Resource Conservation Agency (BKSDA) staff then came to rescue and evacuated the tiger after walking for three days to reach the location, the chairman of BKSDA, Amon Zamora, said on Monday. The tiger was given medical treatment and two of its toes had to be amputated by a team of vet surgeons. The animal is expected to be moved to Bengkulu City for further treatment. This follows a similar incident that took place in Lebong District, Bengkulu last month. In January a sumatran tiger was injured in a trap in Bengkulu. The endangered animal had sustained serious injuries after falling into the trap in the protected Gedang Hulu Lais forest. Local residents, who had found the trapped animal, apparently tried to kill it with spears. But the tiger survived the assault and was rescued and evacuated to Bengkulu city by BKSDA personnel and police. It was then transferred to the Safari Park Veterinary Hospital in Cisarua, Bogor, for treatment. But the tiger died while being treated in the intensive care. The Sumatran tiger (Panthera tigris sumatrae) is a tiger subspecies that inhabits the Indonesian island of Sumatra, Wikipedia notes. The species has been classified as critically endangered by International Union for Conservation of Nature (IUCN) in 2008 as the population is projected at 176 to 271 mature individuals, with no subpopulation having an effective population size larger than 50 individuals, with a declining trend. 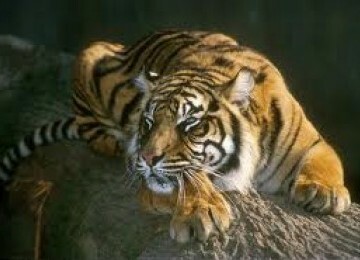 As stated in tigerhomes.org, habitat protection is the key again to the survival of the Sumatran Tiger. If nothing is done to stop human encroachment on Sumatra, this subspecies will become extinct like the Javan Tiger (last seen in 1975). Such a tragedy in animal kingdom!